The Largest Test Bank - Our bank of questions is the largest collection of sample problems available on the market. Our software also authentically emulates the exam environment and provides detailed answer explanations for both incorrect and correct answer choices. Most authentic exam day emulation - Feel right at home on exam day! With our exam-emulating software, we accurately reflect what the exam will look and feel like so much that you will feel like you are just taking another practice quiz when you sit for your CPA exam at Prometric. Physical copies of our books - Our books are broken up into small, comprehensible sections for maximum retention and contain comprehensive outlines and examples. Want to try our full system, including the Mega Test Bank? 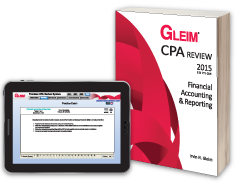 All components of the Gleim Premium CPA Review System are available any time and wherever you have access to the Internet. Get access to the first study unit of the review system absolutely free now!